Great white pelicans are some of the most easily recognized birds in the world. Yellow elastic pouches for holding fish hang off the beak. Like vultures, the face of the pelican is bare and pink flesh. The yellow feet of the pelican are webbed for paddling through water. Early in the mornings, pelicans fish. The rest of the day pelicans bathe and straighten out their feathers. A pod of pelicans will splash and dive through the water, flapping their wings wildly. Then they paddle to the shores and smooth out their feathers. In Africa, groups of eight to twelve pelicans work together in a “U” shape to chase fish into the shallow ends of lakes, swamps, marches, and deltas. Pelicans scoop fish up, tilt their heads back, and swallow them whole. Unlike cartoon pelicans, this species doesn’t fly with fish in their mouths. 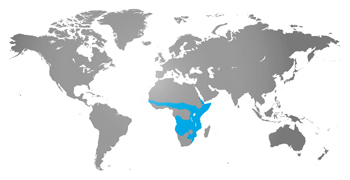 These fish are often cichlids in Africa and carp for migrating pelicans in Europe. Because they work together, pelicans often trick each other and steal each other’s food. While one pelican tries to swallow a large fish, another will sneak up and steal the food right out of its mouth. They also eat eggs and chicks from other water birds, like the Cape cormorant. Even though great white pelicans lay two eggs, only one chick usually survives. Each pelican chick eats approximately 150 pounds of fish before it can search for food on its own. A week or two after hatching, a chick can crawl, but still not lift their heavy beaks. After another week, this species can walk and swim. They naturally run and flap their wings as they get older but cannot fly until nine or ten weeks old. The great white pelican is least concern status.